We open on Tuesday. What's that? You are bringing your entire household? Oh good. Tuesday begins the A Graceful Death exhibition. I know, the A Graceful Death exhibition opens in a couple of days. What's that? You are coming? And bringing your whole street with you? Oh well done. And your extended family too! How wonderful. You are all welcome. The exhibition is challenging, and truthful. It is about what it means to die, and it is good to come and meet all the people I have painted through their written word and their painted images. It is an exhibition about love, life and how normal we, and the dying, are. What better way to ask what dying is like than to ask the dying themselves? We have a full schedule of events, the programme is below. 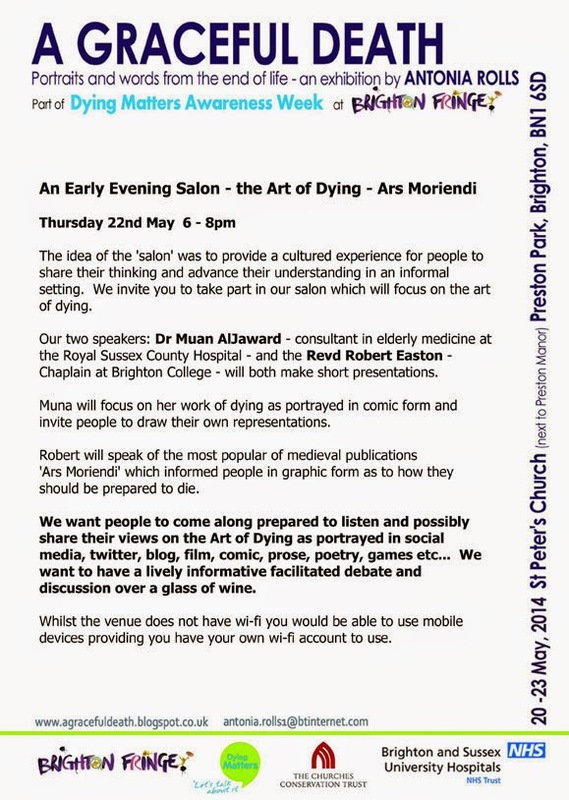 We cover Planning for Dying, Supporting the Dying, Communicating with the Dying and Working with the Dying. Our speakers are all experienced professionals working with the dying, and are wonderful and informative speakers. Each will speak for a while, and then we will open the conversation and debate to the rest of us. It will be fascinating listening to who says what. 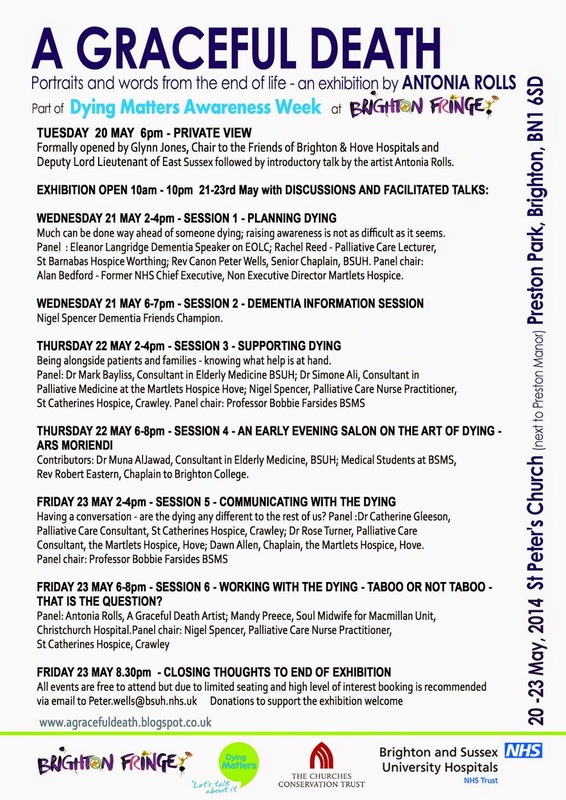 On Wednesday, Nigel Spencer will be holding a Dementia Friends session, and on Friday evening I will be talking with my old friend Mandy Preece, about Working with the Dying. To end the exhibition, after Mandy and I have had our session, the Revd Canon Peter Wells will sum up with thoughts and some gentle, insightful words. The Opening Event, however, will be on Tuesday from 6 pm to 8 pm. I am delighted that Glynn Jones, Chair to the Brighton and Hove Hospitals and Deputy Lord Lieutenant of East Sussex, will speak and open the exhibition. We will also, if they come, be filmed by a South Korean documentary film crew who will be making a three part documentary about end of life matters to be shown in South Korea. They are filming many many different people and events, A Graceful Death is just one of many. But I am very grateful and happy to take part in any way that is helpful. I am also trying not to hope for a tour of South Korea, but that is natural. I would think that. I am wearing denim, if that is what you mean. Very chic for a 53 year old Mum. I am tired but happy. I am on my sofa, thinking that if only I was hungry I would eat something, but I am not and it doesn't seem fair. I have to say I have had my supper, so I am not suffering, not really, but if I had left a chink of space, I could have spent some time deciding on pudding. Oh well. I think this is just procrastinating. For the exhibition next week, all that could have been done, has been done. It will be put up on the Monday and I have the help of my daughter Fancy Girl, and a local artist and friend Vicky Hulatt. Thank you a million times to both of you, by the way. Tomorrow is a day of laminating all that I see, with my new laminator, given to me by the illustrious Mrs Pemberton who is really Olivia Fane. She writes under her maiden name and came by yesterday with exciting news. (And a laminator and some funds for AGD. God Bless you Olivia!). Olivia, clever, challenging, wicked, funny and so un-politically correct but oh so right in every way, independent, eccentric Olivia, will be on Woman's Hour this Monday talking about her new book "The Conversations, 66 Reasons to Start Talking". Listen in, Radio 4 from 10 am onwards. Olivia says she will be on at 10.30. She will be talking about her conversation on Nagging. Very good. She is very entertaining. Tomorrow. Tomorrow, then, I will pack up all my paintings, all the words, all the bits and pieces, laminating everything as I go. I will buy some essentials for the exhibition, like sellotape, name badges, black marker pens and flowers. I will assemble everything eventually, and pack up in my studio, transporting all to the car, in a Zen frame of mind, so that I am living in the present and not concerning myself about the future (which is about the amount of stuff still to do). That is my intention. I will probably do a bit of everything all at once in reality, and tumble somehow into the car, having sellotaped the laminator to my elbow and then I will have a Chinese takeaway and go to bed early. Now I am going to have some tea. I have found some space and I shall fill it with some PG Tips. See you all next week. Me and Steve having a moment of quiet before an exhibition last year. I bought an apple pie and some custard recently, and no one has eaten it. It is in the fridge looking at me every time I open it, and I am sure I saw my name on it. As it has been a long and intense few days, I am going to eat both the apple pie and the custard. It is a well known remedy for tiredness after long and intensive days, it is scientifically proven to make one happy, jolly and full of sunshine. It is in the oven now, and already I feel better. Yesterday, A Graceful Death exhibition went to the Dead Good Day Out, a Festival of End of Life Events (sounds like crazy wilful dying on the spot, and cheering people as they leap off high rise buildings, but it wasn't). 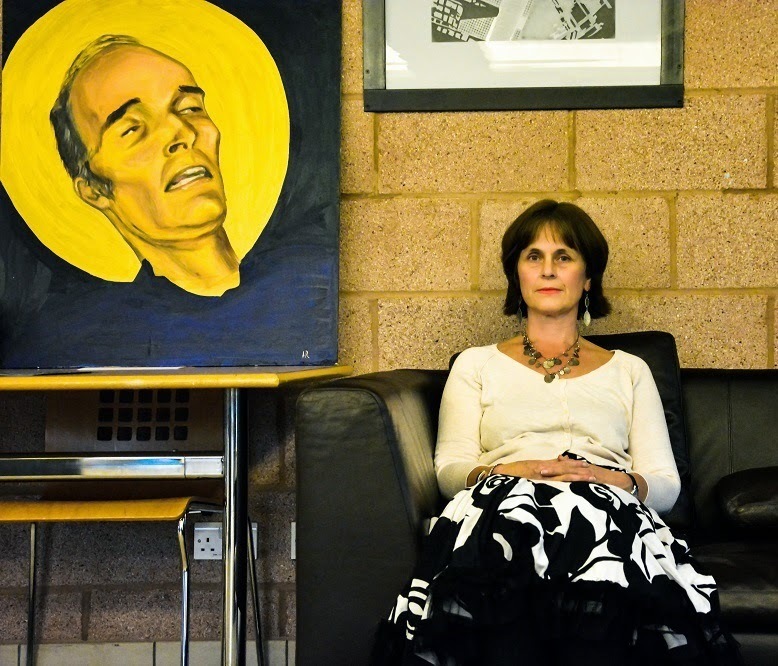 It was held in Southampton, and was a most creative and interesting event full of activities around death beliefs and customs from other cultures, and from our own. I met, amongst others, green burial directors, children's hospice nurses, memorial artists, death mask makers, and a ukulele band. So many things to see, so many different and interesting people to talk to, it was a wonderful event. It is very easy for me to swan around when I do these kind of things, and not spend as much time as I should within AGD listening to people. There is always so much colour and activity going on elsewhere, I think it won't matter if I just disappear and meet this exciting person here, chat to that fascinating person there, and if anyone wants me, they will come back. Or wait. But twice yesterday I was pulled up short and reminded that it is often the person who is hard to communicate with, who is not easy to want to stay and listen to, who needs time the most. A lady came to speak to me who seemed to not be able to finish a sentence without starting another. It was hard to follow her, and though she was wanting to talk, I couldn't work out what she was trying to say. I wanted to move away; I am ashamed to say I thought she was taking me away from other people. I did move away, but she joined me again when I was talking to another man. This happened again and during that second conversation, my lady mentioned that she was interested in painting, and was interested in painting her son who had died when he was a teenager. I understood then why she had found it hard to speak to me, she was working up to mentioning her son, and I had not noticed that she needed some careful listening. Having mentioned her son, and as I understood that she had a huge burden to bear, she became distressed, apologised, and left. And I thought how brave she was. She did not give up, she said what she was going to say, and though she did not stay to talk of it any more, I hope that having said it, she will find a way to get out his photographs, and to paint his portrait. Oh dear, my poor lady, I am sorry I didn't understand when I should have. The second lesson in giving time and not judging, was with an older lady who I found rather disconcerting. I can't say why, there was something about the way she seemed to stare, and to wait a bit too long before speaking. I wondered if she was a little eccentric. She had short dyed black hair, and white eyebrows, which I kept wondering if she knew looked odd, or whether she didn't care. She wafted over and away, gazing at me and looking as if she was about to say something, and then moving off again. Later that evening, most people had left, the event was over, and we were all packing up and away. I was taking paintings down, putting them away, being very busy, longing to get home and have a cup of tea and some silence. One person was left, my little lady with black hair and white eyebrows. And she was still looking at the paintings and reading the stories. I don't remember how we began to talk, but she was very taken with a new addition to the exhibition, about someone who had died young. I had displayed an email from the parents of this little girl, which had moved her. I gave her the email, and she began to cry. Oh my funny little lady. Her friend had committed suicide recently and she was unable to find a way to talk to the mother of her friend. "What should I say?" she said, "she won't reply to me, and I was so close to my friend. I think the mother is too distraught to talk to me, but I want to talk to her." The email from the parents of the little girl had spoken of the need to love yourself, and it was this that she wanted to tell her friend's mother. Here it was again. The moment someone chooses to say what is so hard to say. It isn't always when I am sitting and giving my full attention. This time it was not only when I was distracted by packing up, but I had dismissed her as simply eccentric with nothing to say. I stopped what I was doing then, as I understood that this was the moment for her, and listened to a deeply grieving person. She left after a short while, with the email I had written out for the exhibition, and I continued to pack up feeling subdued and sad. I have just had apple pie and custard. My strength didn't quite return after one helping, so I have had another and yes, the scientists are right. I feel a bit better. I have had the foresight to give the rest to Giant Boy and my older son, Interesting Boy, so I am in no danger of going overboard and eating apple pie and custard till it comes out of my ears and defeats the purpose of cheering one up, instead sending one to A&E with pie and custard poisoning. A team of camera men and a producer from Korea Educational Broadcasting System came today with their translator, to film AGD in the studio, to do an interview with me and to interview Claire Rudland, one of the sitters from the exhibition, who is an absolutely wonderful speaker about the journey through fear, pain and illness towards death, the dying process, except that she did not die. She recovered. And since then, she has lived every moment, good and bad, with a view to making every day count. Claire talking to the interviewer, who was fascinated with her story. Claire was cold and wrapped herself in the Studio Spotty Blanket. Despite getting back really late last night, and despite having to undergo bonding moments with Giant Boy over the Eurovision, I got up very early this morning. I had to clean the house, make a bathtub load of soup (for the Koreans), and unpack the car of AGD paintings, leaving them casually catching the light and looking intriguing in the studio so that the South Koreans would gasp as they walked in through the studio door and say in Korean, Blimey O'Reilly, we are glad we came. And so, the whole of today has been given over to having Korean camera men filming the studio in the studio, outside the studio in the garden, through the studio windows; filming interviews in the studio, filming me getting into my car, filming in the car seat next to me going off to collect Claire, filming me getting out and taking them to the wrong flat, filming me not knowing where the hell my friend lived, filming me phoning her and getting them to the correct place in the end, filming Claire and I saying hello, and then getting in the car to film me driving us to my house, and our conversation. "You've changed your hair!" "Why yes, I have! Do you like it?" "Oh yes. Lighter at the front" and so on. I wondered whether we were meant to be profound and whether they will dub a philosophical conversation over our journey home. Claire was a real hit, she moved the team to tears talking about the mystery of life and death. She was, she is, so articulate and clever. When all the filming was over we had a late lunch of soup and bread and bananas and chocolate and crisps. That's all I had in the house. Both Giant Boy and Interesting Boy joined us, and we had a party. It was a relief to relax with the South Korean team and find out about them and their lives and world. 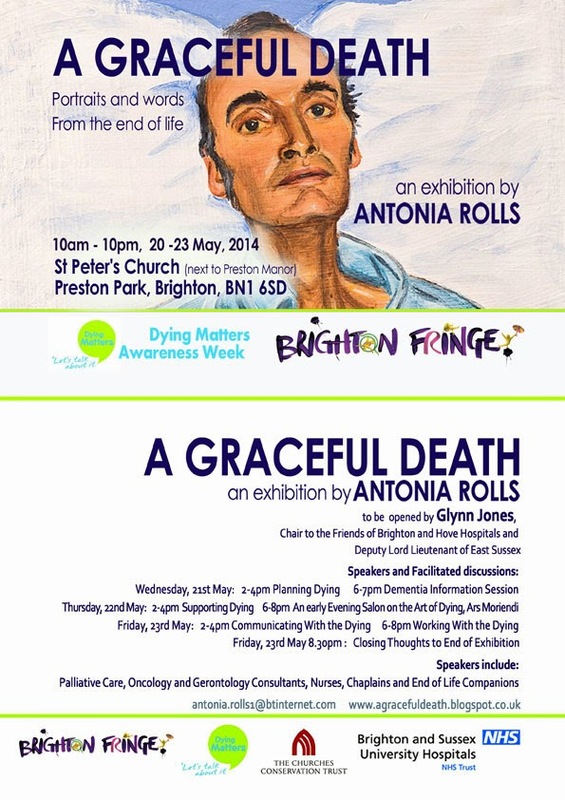 They are filming the opening night of A Graceful Death in Brighton on 20 May, so I will happily see them again. We all liked them very much. The Korean Producer in the studio with a drawing of Claire I did, trembling with nerves, for the camera, in case I made her look like a telly tubby and South Korea would think I was a fraud. Tomorrow I shall lie around peeling grapes. AGD set up ready yesterday, and the artist in a dress that looks as if she wants you to do target practice on it. Closing thoughts to end the exhibition 8.30 pm. Pooped on the Sofa. And a Moment of Peace. This sunny Sunday afternoon I am, quite suddenly, alone. I dare not breathe in case it ends, and I hear someone else in my house. I can feel the air itself whoop for joy, I can feel the house expand, and most of all, I can breathe. It has been busy. My house has been like Paddy's market. From last weekend, we had a count down to yesterday, when my lodger in the annex moved out giving a subliminal signal to all the other lodgers to move rooms, taking with them all their worldly belongings, to set up home in a different part of the house. My annex lodger had been here well over a year. Within seconds of announcing he was leaving to go back home to Sri Lanka, the lady who lives in one of the rooms upstairs had announced that she was having the annex. The lady in one of the other rooms bagged her room and the new Polish man decided to move into the second lady's room. A room, the smallest room in the house, ended up being vacant. Into this moves a lady who lived here before a year ago, who wants to come back. Fine, I said. All is well. Let the action, at ten in the morning on Saturday, begin. It was like the starting line in the Disney film "Cars," with revving engines and wheelies in the air. The first lady from upstairs, who does not like to wait for anything she wants, was more or less camped out at first light in the kitchen of the main house, from where one enters the annex. I had said to her to let annex man leave first before she moved in, but such was her determination, I wasn't sure that she was going to be able. "He is sensitive," I told her,"let him leave before you bring your new kettle, microwave, toaster, bed, wardrobe and bubble bath collection into his space." And so, ever helpful, Lady 1 camped out in the kitchen here, her nose squashed against the glass panes of the annex door, and tried to find things to do until the annex lodger left to catch his plane. Lady 2, who was the opposite, came in from night duty on the day of the big move, and fell asleep at the kitchen table. We were all curious about how she was going to move the stuff from her big room, so much stuff that you couldn't open her door, across the landing to Lady 1's old room. We also wondered how she would then get it all through the door and manage to get in herself. Amongst ourselves, we expected that she would sleep through the whole move. She did wake up though, and move everything but quite a lot of it is still in boxes on the landing. I took a car load of things she didn't want to the tip, and we all believe her when she says she can actually get in to her new room over the top of all the bags and boxes and bin liners full of clothes. Polish man had to wait for everyone else to move first. Unconcerned, capable and with a serious face, he cleaned not only his own room out from top to bottom (ready for the lady who used to live here to come back in), he cleaned Lady 2's room for her. Now, all the lodgers are finding new lives in different parts of the house, and reinventing themselves to suit their upgraded status. I on the other hand, am spent. For a while, it was like four refugees moving their households across my landing to and fro, up and down stairs, with piles of unwanted furniture and bedding growing in the garden as old things were discarded to make way for the new. As landlady, I am sorry but I went out. I came back when I thought it was all done, and so it was. I have taken all the old junk piled up in the garden to the dump, I have cleaned up the trails of debris and I have even changed my sheets. Peace is nearly reigning, as everyone gets used to their new bit of the house. As I sat down to write this afternoon I heard the front door close, and realised with a surge of joy, that everyone had finally gone out and that quite suddenly, I was alone in the house. The joy of it took me by surprise. Today, I have been up since dawn helping out at a fun event on the Bognor seafront, and yesterday, I spent the afternoon with a friend helping her with her Open Studios. Last week, apart from having the new A Graceful Death exhibitions in Southampton and Brighton to arrange, apart from talking to a Friends of Sussex Hospices Ladies Luncheon Club about AGD, I cleared out half of the garage and took it to the tip. Then I tidied up what was left so that if I really wanted to, and had no scruples, I could rent out the garage as an abundantly over furnished living space with no windows, so tidy and neat it is. I also began my new painting, a commissioned double portrait of an older couple sitting in their garden. So today, the day after my house was turned upside down by much heaving and pushing and pulling of beds and televisions and suitcases, by hoovering and cleaning with supermarket own brand squirty cleaning stuffs and hot soapy water, I feel like I have been run over by a truck and it is all that I can do to make myself a huge lunch and eat it alone and gleeful on the sofa. But! I had better get myself back in the upright position. Any minute now, my Polish lady who used to live here is coming back. Her knock on the door will mean that this unexpected time of peace and quiet has ended, and I will have to get off the sofa and rejoin my household. I will decide then whether or not to bustle about again, having benefited from this afternoon of unexpected peace and quiet or whether to give up and go to bed. I think I will go to bed. I will talk to everyone again tomorrow. In the kitchen yesterday watching all the comings and goings with nervous eating of a corn on the cob. Taken by Giant Boy and told to smile and act natural.